AN OTOE AND AN OMAHA TALE. The tales which follow were obtained in Nebraska, from an informant of Otoe extraction, married to an Omaha, and are given as nearly as possible in the words of the narrator. 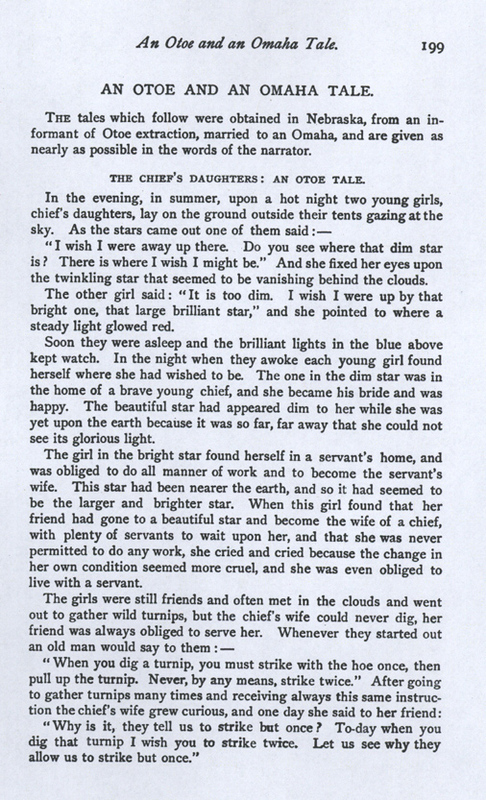 THE CHIEF'S DAUGHTERS: AN OTOE TALE. "I wish I were away up there. Do you see where that dim star is? There is where I wish I might be." And she fixed her eyes upon the twinkling star that seemed to be vanishing behind the clouds. The other girl said: "It is too dim. I wish I were up by that bright one, that large brilliant star," and she pointed to where a steady light glowed red. Soon they were asleep and the brilliant lights in the blue above kept watch. In the night when they awoke each young girl found herself where she had wished to be. The one in the dim star was in the home of a brave young chief, and she became his bride and was happy. The beautiful star had appeared dim to her while she was yet upon the earth because it was so far, far away that she could not see its glorious light. The girl in the bright star found herself in a servant's home, and was obliged to do all manner of work and to become the servant's wife. This star had been nearer the earth, and so it had seemed to be the larger and brighter star. When this girl found that her friend had gone to a beautiful star and become the wife of a chief, with plenty of servants to wait upon her, and that she was never permitted to do any work, she cried and cried because the change in her own condition seemed more cruel, and she was even obliged to live with a servant. "Why is it, they tell us to strike but once? Today when you dig that turnip I wish you to strike twice. Let us see why they allow us to strike but once." The servant struck once with the hoe and took up the turnip, then, as commanded, she struck with her hoe again in the same place. Behold a hole! She leaned forward and looked down. She saw her home. She cried to her friend. "Look! I can see through the clouds. See! there is our home." "What is the matter? What are you crying about?" And they answered, "Because we can see our home. We are so far away, we wish to be there, but we can never get there." The old man passed on. 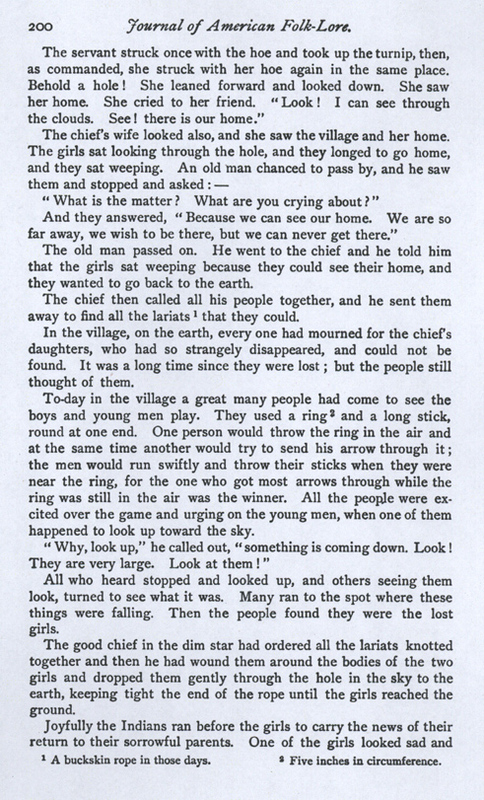 He went to the chief and he told him that the girls sat weeping because they could see their home, and they wanted to go back to the earth. The chief then called all his people together, and he sent them away to find all the lariats that they could. In the village, on the earth, every one had mourned for the chief's daughters, who had so strangely disappeared, and could not be found. It was a long time since they were lost; but the people still thought of them. Today in the village a great many people had come to see the boys and young men play. They used a ring and a long stick, round at one end. One person would throw the ring in the air and at the same time another would try to send his arrow through it; the men would run swiftly and throw their sticks when they were near the ring, for the one who got most arrows through while the ring was still in the air was the winner. All the people were excited over the game and urging on the young men, when one of them happened to look up toward the sky. "Why, look up," he called out, "something is coming down. Look! They are very large. Look at them!" All who heard stopped and looked up, and others seeing them look, turned to see what it was. Many ran to the spot where these things were falling. Then the people found they were the lost girls. The good chief in the dim star had ordered all the lariats knotted together and then he had wound them around the bodies of the two girls and dropped them gently through the hole in the sky to the earth, keeping tight the end of the rope until the girls reached the ground. A buckskin rope in those days. pitiful, the other looked happy as though she had been in some beautiful place. STORY OF THE SKULL: AN OMAHA STORY. "Where are you going, sister-in-law?" "I am going off a long ways." "Let us go together, then," said the second woman. "Where are you going?" and when they answered her she said: "I am going also; let us go together;" and they walked along one after the other. They met a fourth woman, who asked: "Where are you going, sister-in-law?" and she also joined them. Walking in single file, the women came to a pile of bones where people had died. "These belong to you. Carry them." "These are the bones of your relatives. Carry them." The third woman kicked them with her foot, and, turning to the fourth woman, said: "These bones belong to you. Carry them." And the fourth woman answered: "This is the skull of my sister-in-law. You should not be disrespectful. I will carry it along so that you shall respect it." 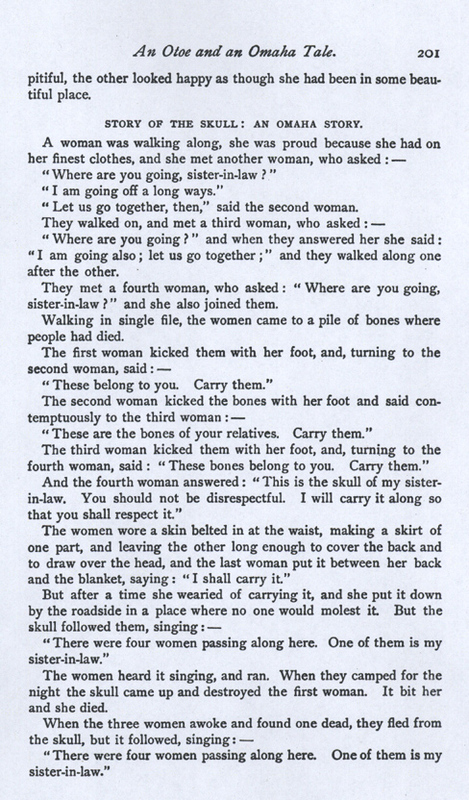 The women wore a skin belted in at the waist, making a skirt of one part, and leaving the other long enough to cover the back and to draw over the head, and the last woman put it between her back and the blanket, saying: "I shall carry it." "There were four women passing along here. One of them is my sister-in-law." The women heard it singing, and ran. 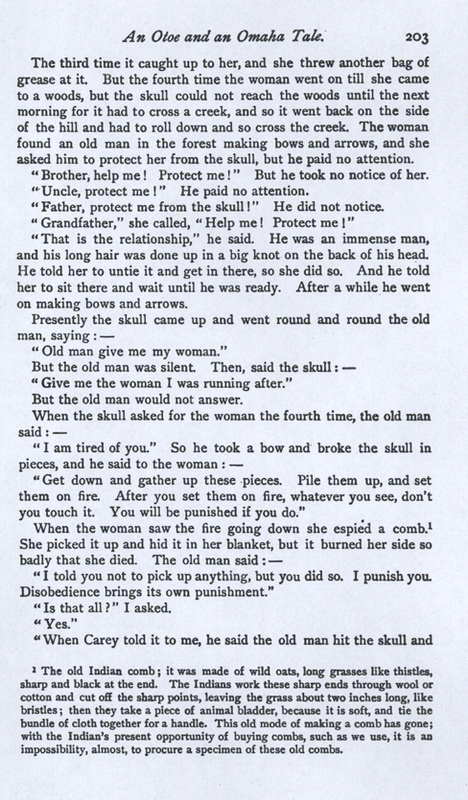 When they camped for the night the skull came up and destroyed the first woman. It bit her and she died. "Look among the trees until you find one where the raccoons have their nest. Then if you are hungry you shall have something to eat. Look for a certain tree, find the hollow place where the raccoon goes in to its nest and drop me in after it." "Cut a hole in this tree and let me out." 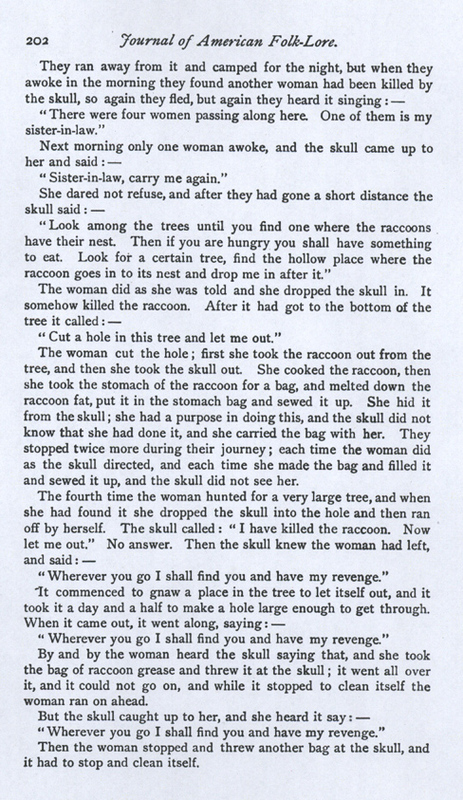 The woman cut the hole; first she took the raccoon out from the tree, and then she took the skull out. She cooked the raccoon, then she took the stomach of the raccoon for a bag, and melted down the raccoon fat, put it in the stomach bag and sewed it up. She hid it from the skull; she had a purpose in doing this, and the skull did not know that she had done it, and she carried the bag with her. They stopped twice more during their journey; each time the woman did as the skull directed, and each time she made the bag and filled it and sewed it up, and the skull did not see her. "Wherever you go I shall find you and have my revenge." By and by the woman heard the skull saying that, and she took the bag of raccoon grease and threw it at the skull; it went all over it, and it could not go on, and while it stopped to clean itself the woman ran on ahead. Then the woman stopped and threw another bag at the skull, and it had to stop and clean itself. The third time it caught up to her, and she threw another bag of grease at it. But the fourth time the woman went on till she came to a woods, but the skull could not reach the woods until the next morning for it had to cross a creek, and so it went back on the side of the hill and had to roll down and so cross the creek. The woman found an old man in the forest making bows and arrows, and she asked him to protect her from the skull, but he paid no attention. "Brother, help me! Protect me!" But he took no notice of her. "Uncle, protect me!" He paid no attention. "Father, protect me from the skull!" He did not notice. "Grandfather," she called, "Help me! Protect me!" "That is the relationship," he said. He was an immense man, and his long hair was done up in a big knot on the back of his head. He told her to untie it and get in there, so she did so. And he told her to sit there and wait until he was ready. After a while he went on making bows and arrows. "Old man give me my woman." "Give me the woman I was running after." But the old man would not answer. "Get down and gather up these pieces. Pile them up, and set them on fire. After you set them on fire, whatever you see, don't you touch it. You will be punished if you do." "I told you not to pick up anything, but you did so. I punish you. Disobedience brings its own punishment." The old Indian comb; it was made of wild oats, long grasses like thistles, sharp and black at the end. The Indians work these sharp ends through wool or cotton and cut off the sharp points, leaving the grass about two inches long, like bristles; then they take a piece of animal bladder, because it is soft, and tie the bundle of cloth together for a handle. This old mode of making a comb has gone; with the Indian's present opportunity of buying combs, such as we use, it is an impossibility, almost, to procure a specimen of these old combs. it went into the air; when it came down it turned into knives, forks, thimbles, threads, awls, wax, needles, and scissors. The man told the woman to come down from his hair but not to pick up anything that was on the ground; if she did he would punish her. And the old man went off and sat down under a tree. She tried to pick up a pair of scissors; when she did so her hands dropped off. That is the way Carey told it." "Carey did not get it right. 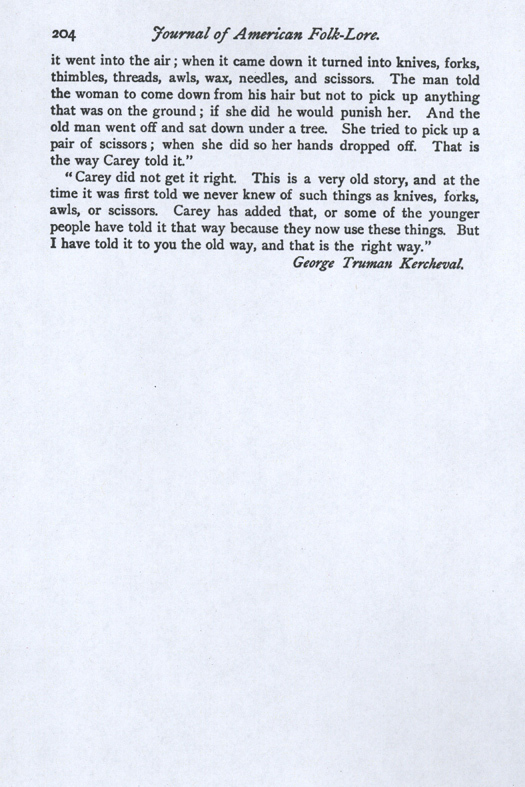 This is a very old story, and at the time it was first told we never knew of such things as knives, forks, awls, or scissors. Carey has added that, or some of the younger people have told it that way because they now use these things. But I have told it to you the old way, and that is the right way."